World Superbike champion Jonathan Rea during the first winter test at Motorland Aragon in Spain. World Superbike champion Jonathan Rea says he was ‘very encouraged’ after completing the first winter test on the 2017 Kawasaki ZX-10RR at Motorland Aragon. 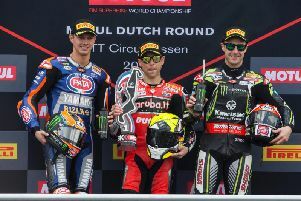 Rea, who sealed back-to-back world crowns last month in Qatar, dipped under the lap record at the Spanish circuit, setting his best time in 1m 49.8s, with team-mate Tom Sykes lapping in 1m 50.421s to go second ahead of Aruba.it Ducati’s Chaz Davies. The two-day test concluded on Thursday but the World Superbike riders will undertake a further test over four days from next Monday at Jerez. “The base bike was working quite well here and the track was in quite good condition on both days. We lost a bit of time on day one but on the second day we got really stuck into our test plan,” Rea said. “Kawasaki has been working hard on the engine side and we had some upgrades on the chassis, which were positive. Showa have been working well and brought a new shock and forks to try. We are pretty happy and we can continue our work on the suspension side in Jerez next week,” he added. Rea is a huge odds-on favourite to be crowned the Irish Motorcyclist of the Year in Belfast in January. The 29-year-old lifted the famous Joey Dunlop trophy last year after winning the World Superbike title for the first time.